Capesthorne near Macclesfield is the home where the Bromley-Davenports and their ancestors, the Capesthornes and the Wards, have lived since Domesday times. The present house, which was built to replace an earlier one, was built in 1722, and altered by Blore in 1837, and Salvin in 1867. 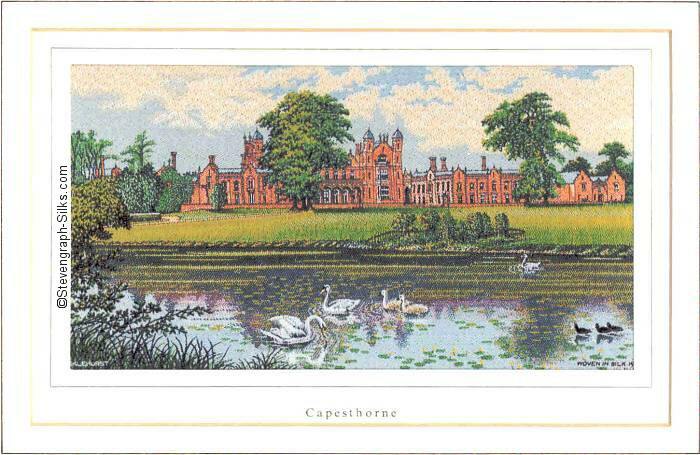 Capesthorne contains a great variety of treasures: fine paintings, furniture, marbles, Greek vases, silver and family muniments dating from 1153. Between 1979 and 1988 only two (silks) were produced - in 1981 GAWSWORTH HALL and in 1983 CAPESTHORNE HALL. No woven pictures were produced from 1984 to 1988, but five more printed silk pictures were made available for collectors.